I have got to go. I’ve gotta go. I have got a book. I’ve gotta book. Do you want to dance? Wanna dance? Do you want a banana? Wanna banana? Let me in. Lemme in. Let me go. Lemme go. I’II let you know. I’II letcha know. Did you do it? Dija do it? I’II meet you later. I’II meechu layder. What do you think? Whaddyu think? What did you do with it? Whajoo do with it? How did you like it? Howja like it? When did you get it? When ju geddit? Why did you take it? Whyju tay kit? How is it going? Howzit going? Don’t you get it? Doancha geddit? Let me do. Lemme do. Let’s give me your heart. Gimme your heart. I should have told you. I shoulda told you. thank you a lot for your kindly help in English. Thanks you so much for your helping us on how to learn and improve our English thanks you once again. 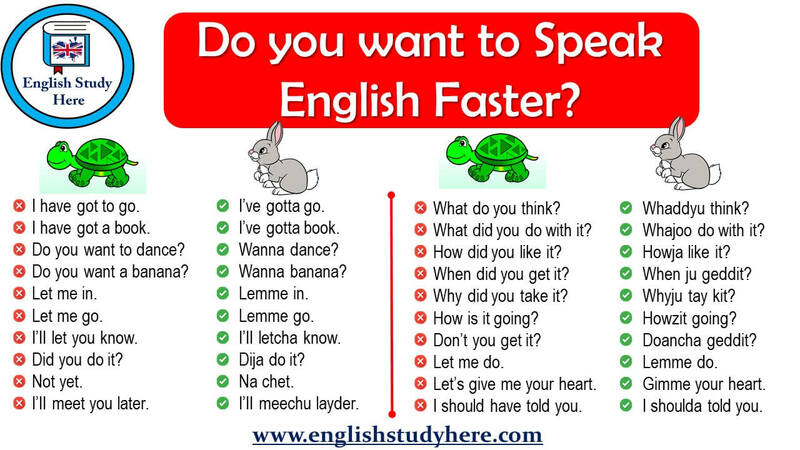 Yes ,I want to learn english.I really like learn english . It’s really smartering, i love this page. What a skillful learning page!